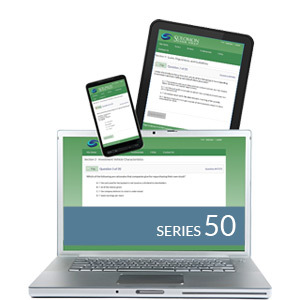 Sample a FREE demo of our Series 50 Online Exam Simulator here! Five decades in the muni business didn't guarantee I'd pass the Series 50 pilot exam. (Just knowing content doesn’t mean you are ready for the test.) Thankfully, my Solomon Exam Prep materials were fantastic at teaching complex subject matter in a way that made the answers clear, and I passed the test with ease. If you plan to take the Series 50 exam, then I strongly recommend that you give yourself the edge that Solomon's study materials provide. The folks at Solomon Exam Prep were incredibly responsive and helpful to any questions I had. Their practice exams helped me prepare for (and pass) the Series 62. I really appreciate all the help along the way.